Film director great Akira Kurosawa learned a powerful lesson while he was working under Kajirio Yamamoto. His mentor told him “Don’t try to BS people. If you don’t know the answer, don’t say anything until you can find out for sure“. The only place you can find out for sureis at gemba. The quote is from the outstanding book I am currently reading: The Birth Of Lean from the Lean Enterprise Institute. 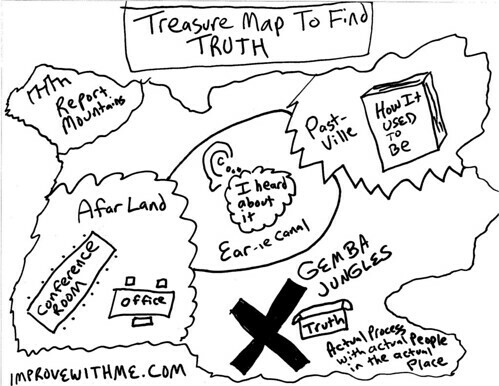 I created this drawing to show places people try to find the treasure of truth instead of seeing where “X” marks the spot in gemba. Afar Land: This is the office or conference room where people decide what the solution is without ever seeing the problem. An Ivory Tower is too far removed from the reality. Think of Hall ‘N Oats “You’re Out Of Touch”. Report Mountains: Taiichi Ohno states “Data is of course important in manufacturing, but I place the greatest emphasis on facts.” Many people associate using the scientific method because they are driven by reports and graphs but miss out on the empirical aspect. Reports only suggest facts/truths but they still need to be validated. Ear-ie Canal: When someone tells you about a problem, it is usually from a subjective perspective based on their interpretation of facts. This method becomes increasingly unreliable the more it is passed around before it reaches you. Past-Ville: Using “how it it used to be” as your basis for truth is dangerous because things may have changed since you last visited. Gemba Jungles: The truth is only found when you go and see the actual work being done. Like a criminal investigator, gathering real-time evidence in the space of the crime will paint a more accurate picture of the situation. The wild gemba jungles do not have the limitations of the other locations on the map. The next time you need truth, take the direct route to the gemba jungles. I really found a lot to reflect on these great articles related to Lean Leadership. Check them out! In 1955, Cyril Northcote Parkinson wrote what has become Parkinson’s Law: “Work expands so as to fill the time available for its completion.” The background on this is on Wikipedia. Lean organizations should have a keen sense to look for this law because it will be fertile ground for improvement. A lot of front-line workers will not tell you they are stretching the work out throughout their shift because they may not realize they are doing it and it might be perceived there is not enough for them to do which may threaten their job. It might be obvious there is waste involved when this law is in effect but it can be sneaky to find where it is happening. This law does not scream there is a problem going on so you have to go to Gemba and look for it (almost like an exterminator). A good place to start is to ask staff what busy work they do. Remember the Lean adage “No problem IS a problem” and investigate to find this sneaky waste! Many organizations are facing difficult times due to the financial crisis. It is an easy temptation to get things out rather than get things right when the pressure is strong. The integrity of your Lean journey may be lost if your approach changes drastically. There are two basic philosophical ways to implement Lean in your enterprise: Coaching towards the solution or coaching towards the method (check out Mark Graban & Jamie Flinchbaugh’s excellent discussion for more on this). If your approach has been to coach towards the method, think of the repercussions if you begin to coach towards the solution. I highly suspect organizations that already coach towards the solution will probably not switch to coaching to the method in a crisis. This warning is just to ensure you use discernment before choosing to change your methods. Understand that a temporary change of course can potentially bring you to an undesired destination. Executives and managers are bottle-necking Lean growth when they solve problems. They claim they do not have time to go to Gemba to gain a deep understanding of the problem because they are too busy in problem solving meetings (don’t fool yourself – even decision-making meetings are still about problems). Leadership indirectly demonstrates lack of respect and trust when they do not engage the people doing the work to solve problems (waste of talent). Coaching opportunities are missed when leadership doesn’t equip and support all staff to identify root cause, gain consensus, and experiment with counter-measures (becoming a learning organization). You will never see the gains you desire with Lean until executives and managers turn over the problem-solving duties to the people doing the work. It wil take coaching and support, but that time is better spent than solving problems in an ivory tower. I have heard resistance for going to Gemba and I want to address any myths and misunderstandings. You only need to go to Gemba once: If you have multiple operators and/or lack of standard work, going once will not show the variation that exists. Gaining a deep understanding of the problem and root cause might require seeing it more then once. This happened to me a few months ago when I saw the process on an off day and thought the root cause was something else entirely than what it truly was. Going once leads to poor assumptions which can be costly if you assign resources to improve based off of limited understanding. It is not worth a person’s time because their services are needed by the customer: The people who are critical to your customers are the ones who will gain the most by going to Gemba. Since they provide the service, seeing the process will help them improve what they do every day. They are your key stakeholders for any change and their Gemba experience will make your case for improvement more than any meeting or PowerPoint slide. A report will tell me all the information I need about the problem: Reports may show waste of waiting but not what is causing the delay. Data can tell you that you have over-processing waste through excessive approvals but does not demonstrate what is driving need for the inspection steps. A chart may explain unnecessary transportation but the space will provide insight on how to reduce movement. A report that is read in a conference room is out-of-touch from the people doing the work and causes the waste of poor utilization of people’s skills. I do the work every day so there is no need to watch it: There is always value from stepping back and watching the work being done. Our “waste goggles” are not finely tuned when we are focusing on customers or other processing. We also see ourselves doing the work as it “should be” other than how it actually is. I have read about hospital hand-washing studies where doctors say they always scrub their hands but observers saw they didn’t. There is an even worse assumption related to this: “I used to do the work so I already know it”. What other excuses are stopping you from going to Gemba? “A process that quickly jumps to a solution … without a good understanding of the root causes, though it may achieve desired results, would not be viewed as a successful project.” – Understanding A3 Thinking (Sobek/Smalley) Page 15. The truth is, both desired results and the improvement process are equally important. It is easy to understand why it is undesirable to follow the improvement process but not achieve desired results. What is hard, is the major cultural shift from only wanting the results at the expense of following the improvement process. Due to limited resources, clients want the improvement results, but are asking internal consultants to be the go-getters. I think this model has it’s place early in Lean transformations, but this is a difficult situation to turn around. If clients and their teams are not doing their own time observations, pulling their own data, going to gemba, understanding root cause, and making their own recommendations then their Lean progress is stunted. I view my role as being able to help coach, guide, and teach clients and their teams to “learn to see”. If it is just me doing the majority of it, it comes at the expense of their Lean maturity. This includes someomne else preparing tabels and charts for them in place of gemba but that is a topic for a different post. This is an interesting situation. Many times, it is difficult to get a culture that wants to change or improve. When you have a culture that wants the results of change, it is important to remain principled and not do it all for them because that is a long term disservice in my opinion. Computerized spreadsheet applications are celebrating a 30-year anniversary. Are Excel and other spreadsheets good or evil? John C. Dvorak wrote a great article, The 30th Anniversary of the (No Good) Spreadsheet App stating spreadsheets and the rise of accountants to positions of power have caused society to deteriorate. Myoptic data: Everyone seems to have Excel but may not have all of the data to input into their spreadsheet. People might number crunch but do not have a systems viewpoint. Comparison of other factors is often left out. I had a situation where execs were in a panic over a spreadsheet showing lost revenue but nobody compared it to the data showing greater savings gains than the loss incurred. Charts can lie: Ever hear “liars use numbers”? Changing the height and width of the x and y axis on a graph can display the same data with a different visual impact. A long x axis with short y axis can make increases look gradual. A tall y axis with short x axis will make the increase look sharp. Charts can be used as a tool of influence and not purely objective data. Not everyone is good at Excel: There are people who mess up all their columns when they try to sort. Formulas can be highly funky sometimes. We can’t trust all spreadsheets because we do not know the author’s skill-set. Gemba is avoided: Dvorak mentions how a CEO doesn’t want to disagree with what a spreadsheet told him. If leadership went to Gemba to see, more root cause problems will be fixed. Spreadsheets often just show a symptom. This is a great talk from Jonathan Drori at TED which shows the importance of going to Gemba to test and trial our assumptions. RSS readers will need to open this post to view. One of the biggest lessons I learned from the Sensei during my shop-floor Kaizen was the importance of not fixing errors passed on to you without involving the team that made the mistake. The paint team did not always clear the holes where parts were to connect. My sub-assembly team would just grab a grinder when they found the problem and fix it themselves. The Sensei had them pull the andon and bring someone from the paint team to correct the error with the sub-assembly team instead. The timing took longer when the other team had to come into the sub-assembly area but it brought an awareness back to the paint team to ramp-up their quality control. During the three days I was watching the process, I did not see the paint error go away, but I do know they started a plan to prevent the problem in the future. They never would have made these plans if they were not alerted to the error. This also brought the paint team to gemba instead of just getting a report or email of the problems experienced. The sub-assembly team was able to continue working on other areas of the product while the paint team fixed the mistake. By not spending their time fixing another department’s mistake, the sub-assembly team was able to continue their focus. In a an organization with strong team values, it is easy for workers to quietly fix a mistake passed on to them. Errors become persistent and do not stop in that kind of environment. If we change our culture and bring back “That’s not my job”, we can make great strides in quality. What was observed by us is the nature or matter of the Milky Way itself, which, with the aid of the spyglass, may be observed so well that all the disputes that for so many generations have vexed philosophers are destroyed by visible certainty, and we are liberated from wordy arguments. Galileo Galilei was a Tuscan (Italian) physicist, mathematician, astronomer, and philosopher who played a major role in the scientific revolution.